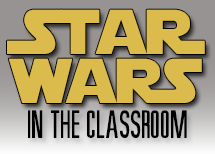 In this unit, you will learn about a conflict between the United States and some other nations that started during World War II and some argue is still going on today, and you will learn all about it by watching Star Wars! Say, "Thank You Mrs. Smith!" Everything important you need to understand about American History can be learned from watching the Star Wars Saga! It is true! This is because random dates, timelines, and listing wars on your fingers are not what is important about history. History is about the big ideas. It is about the things that changed our world. It is about learning from the mistakes we made and understanding the consequences of those we didn’t. History is humanity’s diary. We record what we do and how we felt, then reflect on these records as we grow and develop. This unit will be a little different from the other units because we will use another site for most of your lessons. You will access those lessons by clicking on the icons below!